Ecuador es uno de los más pequeños en América del Sur, está atrevesado por la línea Ecuador (de donde toma su nombre) que lo divide en dos hemisferios, limite al norte con Colombia, al sur y al este con Perú al oeste con el Océano Pacífico. Con este territorio relativamente pequeño, Ecuador tiene la mayor biodiversidad por área en el Mundo. En un estudio de Conservación Internacional, Ecuador está considerado entre los 17 países más "Megadiversos" entre ellos están: E.E.U.U, China, Australia, Brasil México. Con 9.2 especies por km2, este ocupa el primer lugar en el mundo con referencia a las especies por área. La riqueza de este país se basa en su diversidad tanto natural como cultural por eso catalogado uno de las países más megadiversos del mundo. Ecuador tiene 4 regiones naturales: La Selva, La Costa, La Sierra y Las Islas Galápagos o archipiélago de Galápagos. Estas cuatro regiones se subdividen en 24 provincias, además de su exuberante biodiversidad, Ecuador tiene una impresionante variedad de grupos étnicos, incluyendo algunas comunidades que todavia mantienen sus manifestaciones culturales ancestrales. Industria: Petróleo, banana, camarones, pescado, café, textiles,oro, plata, papel, madera, químicos, plasticos, pesca, madera. Esmeraldas, Manabí, Guayas, Santa Elena, Los Ríos y El Oro. Las provincias de la Sierra son: Carchi, Imbabura, Pichincha, Santo Domingo de los Tzáchilas, Cotopaxi, Tungurahua, Bolívar, Chimborazo, Cañar, Azuay y Loja. Las provincias de esta región son: Sucumbios, Napo, Orellana, Pastaza, Morona Santiago y Zamora Chinchipe. The Galapagos islands (official name Archipiélago de Colón) is a group of islands in the pacific and belong to Ecuador. In total 13 bigger islands (Santiago, Santa Cruz, Floreana , San Cristóbal, Española, Genovesa, Santa Fe, Isabela, Fernandina, Darwin, Roca Redonda, Marchena, Pinta), 8 small islands and approximattly 40 "mini-islands" belong to this national reserve. 2001, approximatly 18'500 people lived on those islands. The Flora and Fauna on these islands is fabulouse and if you are in Ecuador it is a must to visit these islands. Ecuador is located in the Tropical Zone, thus, the climate throughout the country ranges from tropical equatorial rainy weather to perpetual snow on the top of the mountains due to the influence of the Andean Mountain range in the highlands. Cities in the highlands have temperatures that vary from 10 to 22 °C, while coastal cities’ temperatures vary from 15 to 28°C during the day. The jungle has constant weather conditions: rainy, humid and warm. The Galapagos Islands are always sunny and warm. Temperature drops a bit during the months of June to November. Galapagos: wear comfortable walking shoes and casual clothing. Shorts, t-shirts and summer clothing will be just tine. Don’t forget a hat and sun block as they are a must along with a bathing suit. No innoculations are required for entry. However, it is reccomended to get vaccinations for hepatitis A and B, typhoid, and there is a minor risk of cholera and rabies. It is strongly recommended to get a yellow fever vaccination if you plan to visit the rainforest during rainy season. Please consult your doctor for further informaition. According to different scientist and historians, large groups of people from Asia crossed the Bering Strait eventually reaching the South American continent and settled down. Archaeological evidence found in the small village of Punin (South of Riobamba) shows that this settlement period lasted several hundred years. The tribes that lived during this period of time were farmers, fishermen, and craftsmen. These societies had very marked social divisions with the priests acting as the rules. This tribe constructed temples of polished and caved stones. Quito was used by the first Spaniards, who took this name form the Indians. Quito not only applied to a single place, but also to a region and latter to the territory Known as Real Audiencia de Quito during the colonial time. 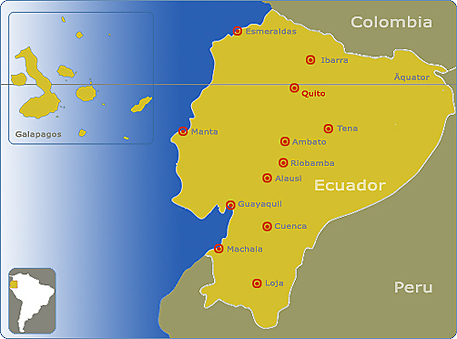 The name of this Spanish colonial territory was changed to Ecuador when the Republic was formed. Huayna-Capac continued the invasion. In Quito he knew Paccha with who had a son Atahualpa, who was his favourite son and the last Inca. The Inca Empire, divided by political and racial hatred became weaker, and even when Atahualpa defeated Huáscar; it was not possible to unify the Kingdom again. Due to these circumstances, it was easy for Spaniards ton conquer the great Tahuantinsuyo. Francisco Pizarro arrived in the Incan Empire in Septembre 1532 on a exploratory mission. Pizarro arranged a meeting with Atahualpa. It was held in Cajamarca (Perú) on November 1532. Once Atahualpa and his retinue were at the meeting place, the Spanish Conquistadors massacred most of Atahualpa’s people and captured him. Atahualpa was condemned and executed on August 29, 1533. The first serious attempt was made on August 10, 1809 in Quito. A group of patriots formed by well-known lawyers and writers. The preceding night, they resolved to replace the tyrannical Spanish authorities with a patriotic group called the Sovereign Board led by the Marquis of Selva Alegre and Juan Pío Montúfar. The same day that Ecuador made its separation from Gran Colombia the main civil, military and religious authorities met together declare Ecuador as a sovereign independent nation. General Juan José Flores was in charge of the government. On August 10, 1830, General Flores convened the Congress that created the first Ecuadorian Constitution. In this legal document Quito was declared capital o the, new republic. The Constitution promulgated laws in favour of democracy and elections.